At ThriveTracker, we take pride in pushing to stay ahead of the curve. So it should come as no surprise that for our latest update, we had some big ideas. The team is excited to announce the most recent improvement to the ThriveTracker platform – our newly redesigned dashboard. With our latest update, not only will you notice a more vibrant and intuitive display, but you’ll also find a welcome shortcut to viewing key metrics, making efficient analysis easier than ever. And did we mention that the dashboard is now completely optimized for mobile? You probably noticed right off the bat – your ThriveTracker dashboard got a modern makeover. While the majority of the categories that are represented on your dashboard remain the same, the information is now organized in a way that makes it much more digestible at a glance. 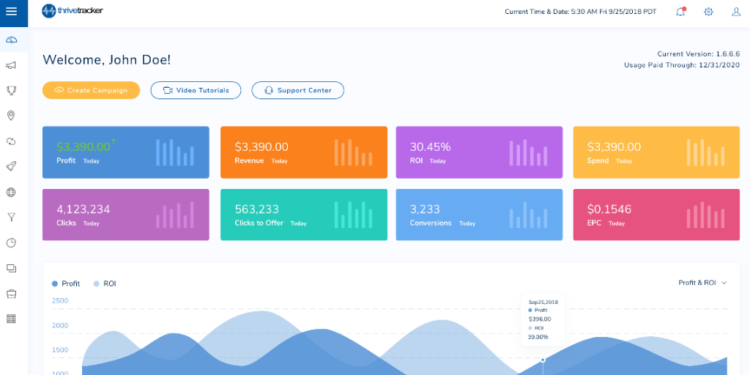 Your dashboard is meant to present you with the most vital analytics in an easy to interpret manner, and that’s the express purpose of our new design. 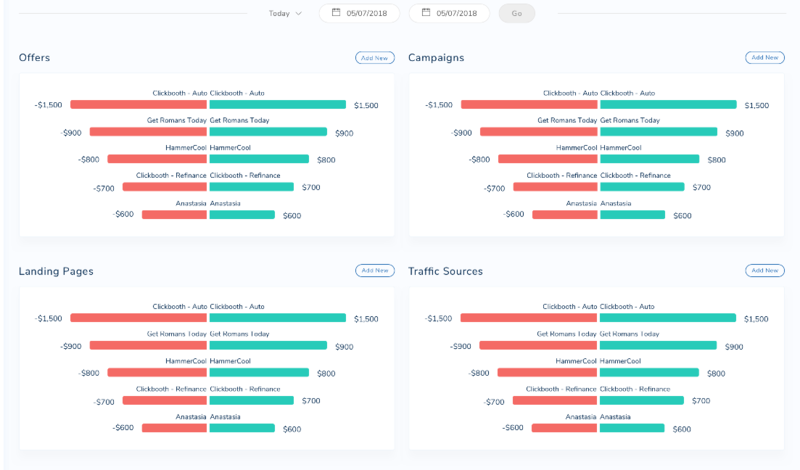 Your account’s pulse at top of the dashboard now shows you the eight most vital metrics from your campaigns, with each metric placed within its own distinctly colored tile. We’ve simplified this display from 12 data points to 8 to ensure that your dashboard is not showcasing redundant metrics. You’ll also find a more fluid Profit and ROI graph that allows for easier comparison at a glance between the two sets of data. Moving down the page, the “Today’s Top Performers” section now presents your five leading Offers, Campaigns, Landing Pages and Traffic Sources, with their corresponding profits or losses graphed for each. With form inspired by function, our updated design is guaranteed to improve your dashboard experience. While we love the revitalized new look of our dashboard, it’s more than just a design change. We’ve also updated which data points are displayed, and how they’re presented – for a reason. 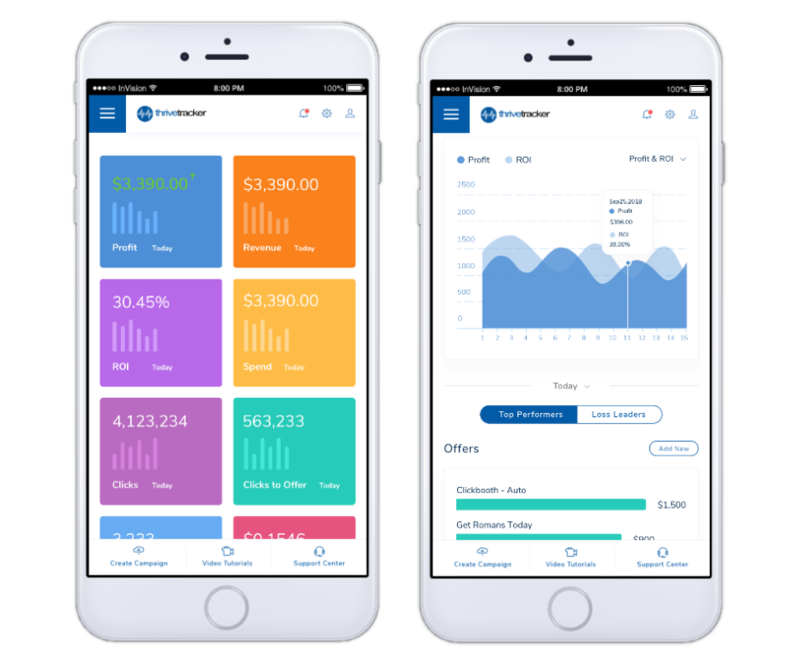 While ThriveTracker never touches your earnings, every decision made within the confines of ThriveTracker is responsible for affecting your money making process. Our new dashboard enables you to achieve a more complete 30-second analysis of your account. If all the data looks good, that’s it, your day’s work is done! But if the metrics are showing something other than expected results, you now know to dive into your account and make immediate changes. Everything on your new Thrive dashboard is there because it is relevant to your daily business needs. We reduced the “Pulse” section from 12 data points to only the 8 most essential parameters you need to know at that precise moment. Moving down to the “Profit and ROI” dashboard graph, we’ve gone from displaying 90 days to just 15 days. You can still find the 90-day view within the depths of your account, but for the purposes of quick analysis, a 15-day graph is much more relevant to your day-to-day business. While most sections have been consolidated for more efficient analysis, the former “Top Performers” section has been expanded to give equal and relevant insight into both the good and the not so good in each category. You’re now shown your top-five best and top-five worst performing offers, campaigns, landing pages, and traffic sources for the date range you choose. 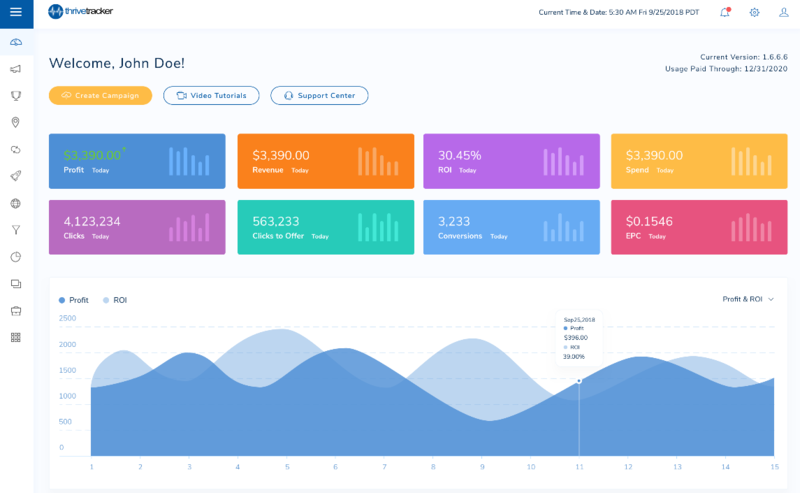 A true dashboard is meant to provide you the comprehensive overview you need in what little time you have available, making you aware of not only the best parts of your performance but also the worst. If something’s out of place, or not performing as expected, it will be seen immediately upon viewing your new dashboard. No more digging for your biggest opportunities – they’re now displayed front and center. In the world of performance marketing, things can, and will, change at a moment’s notice, so you need to be able to access the vital metrics at a moment’s notice. That’s why we’re so excited to announce that our new dashboard is 100% optimized for mobile use. Now, when you sign in to your ThriveTracker account on your phone, you’re able to do the same 30-second analysis of your account as you can on your desktop. No scrolling back and forth, no zooming in or out – just a clean, easy-to-read dash, at your fingertips. There is no more waiting to improve your business because you didn’t get to see the information you needed when you had a moment to spare. If you’re a current ThriveTracker user and you’ve yet to see the new dash, we highly encourage you to explore. The new look has been rolled out and is currently available to every Thrive user. Interested in starting your own account? Prospective ThriveTracker users can explore the new look via our demo here, and take advantage of our free 14-day trial. Our team at sales@thrivetracker.com is ready to help get you started!